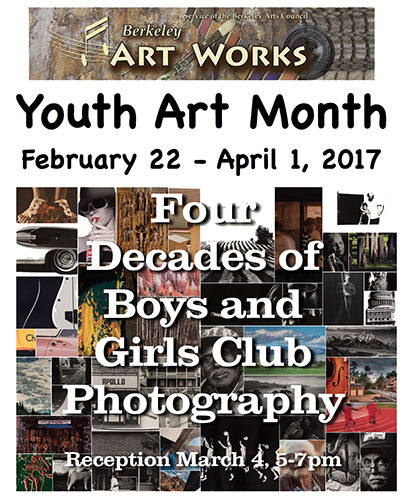 In celebration of Youth Art Month, The Berkeley Arts Council presents a retrospective exhibit of student photographs created over the years in the Martinsburg Boys and Girls Club photography program. The exhibit will be on display at the Berkeley Art Works, 116 North Queen Street in Martinsburg, February 22 through April 1. The program, led by teacher Pat Murphy, has produced numerous national and regional winners in various competitions. Murphy started out helping the kids in the program in exchange for being able to use the darkroom for himself. Over time, he spent more time working with the students and less time on his own work. It’s been his passion for nearly 50 years. The exhibit is curated by Rip Smith and Gary Bergel, who sifted through literally thousands of prints in the basement of the club to select a representative sample of images that exemplify the best the program has to offer. Gallery hours are Wed-Fri 11-5, Sat 11-4. There will be a reception Saturday, March 4 from 5-7pm.